The components of the Brachial Plexus is a topic that is always important to review, as it is so significant to everyday clinical practice. Here is a brief overview of the divisions and actions of each component. Axillary Nerve – It supplies two muscles, deltoid (a muscle of the shoulder), and teres minor (one of the rotator cuff muscles). The axillary nerve also carries sensory information from the shoulder joint, as well as the skin covering the inferior region of the deltoid muscle – the “regimental badge” area (which is innervated by the Superior Lateral Cutaneous Nerve branch of the Axillary nerve). When the axillary nerve splits off from the posterior cord, the continuation of the cord is the radial nerve. Radial Nerve – The radial nerve is a nerve in the human body that supplies the upper limb. It supplies the triceps brachii muscle of the arm, as well as all 12 muscles in the posterior osteofascial compartment of the forearm, as well as the associated joints and overlying skin. It originates from the posterior cord of the brachial plexus with roots from C5, C6, C7, C8 & T1. The radial nerve and its branches supply the dorsal muscles, such as triceps brachii, the extrinsic extensors of the wrist and hands, and the cutaneous nerve supply to most of the back of the hand. (The ulnar nerve cutaneously innervates the back of the little finger and adjacent half of the ring finger). The radial nerve divides into a deep branch (which becomes the posterior interosseous nerve), and continues as the superficial branch which goes on to innervate the dorsum (back) of the hand. 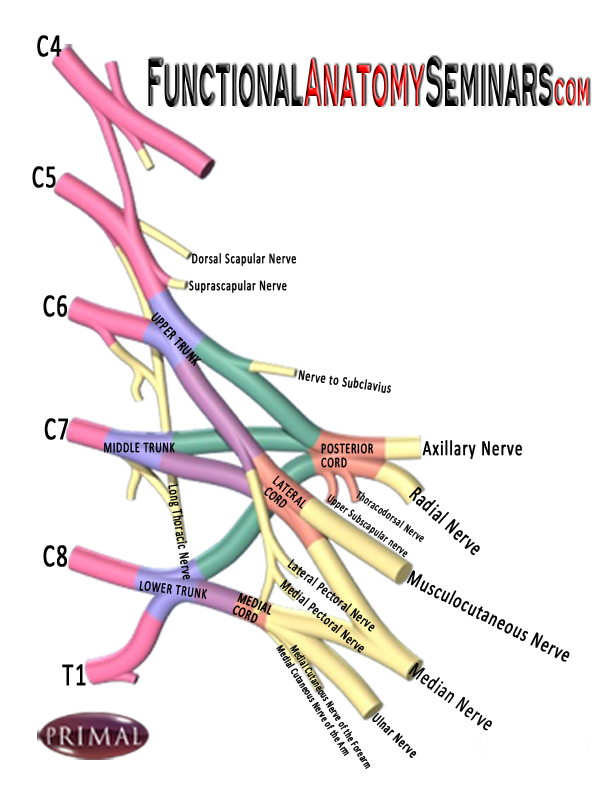 Musculocutaneous Nerve – A terminal branch of the lateral cord of the brachial plexus, containing fibers form the C5, C6, and C7 spinal segments. It pierces coracobrachialis, continuing downwards and laterally between biceps and brachialis muscles. At the elbow, it pierces the deep fascia to continue as the lateral cutaneous nerve of the forearm. It gives muscular branches to coracobrachialis, biceps, and brachialis, and an articular branch to the elbow joint. Median Nerve – The median nerve (C5, 6, 7, 8, T1) is motor to most of the long flexors of the forearm and muscles of the thenar eminence. It supplies sensibility to the skin of the palm, (usually) radial three and half digits, elbow, wrist, and hand joints. Ulnar Nerve – The ulnar nerve (C7, 8, T1) is the continuation of the medial cord of the brachial plexus. It is usually joined in the axilla by fibers from C7. The ulnar nerve is motor to most of the small muscles of the hand, to flexor carpi ulnaris, and to the ulnar half of flexor digitorum profundus. It provides sensibility to the ulnar aspect of the hand. Dorsal Scapular Nerve – Arising from C5 ventral ramus (often with contributions from C4), the nerve pierces the scalenus medius to travel behind the levator scapulae (as it serves it with motor innervation) with the deep branch of the dorsal scapular artery. They travel to and supply the rhomboids major and minor. Suprascapular Nerve – Arises from the upper trunk of the brachial plexus containing fibers from C5 and C6 spinal segments. It passes through the suprascapular foramen (located on the superior aspect of the scapula) to supply supraspinatus. A branch traverses the spinoglenoid notch to supply infraspinatus. Nerve to Subclavius – The nerve to the Subclavius (or subclavian nerve) is a small filament, which arises from the point of junction of the fifth and sixth cervical nerves. It descends to the subclavius muscle in front of the third part of the subclavian artery and the lower trunk of the plexus, and is usually connected by a filament with the phrenic nerve. Long Thoracic Nerve – The long thoracic nerve supplies the Serratus Anterior muscle. This nerve arises by three roots from the fifth, sixth, and seventh cervical nerves (C5-C7) but the root from C7 may be absent. The roots from C5 and C6 pierce the Scalenus medius, while the C7 root passes in front of the muscle. The nerve descends behind the brachial plexus and the axillary vessels, resting on the outer surface of the Serratus anterior. It extends along the side of the thorax to the lower border of that muscle, supplying filaments to each of its digitations. Thoracodorsal Nerve – The thoracodorsal nerve arises between the two subscapular nerves (upper & lower) off of the posterior cord, containing fibers from C6, C7, and C8 spinal segments. With the subscapular vessels it passes along the lateral border of subscapularis to supply latissimus dorsi. Upper & Lower Subscapular Nerves – Upper and lower subscapular nerves arise on either side of the thoracodorsal nerve off of the posterior cord. The lower subscapular nerve is larger, passing downwards to supply subscapularis (C5,6) and teres major (C6,7). Lateral Pectoral Nerve – Arises from the lateral cord, or from the anterior divisions of the upper and middle trunks just before these merge to form the lateral cord. It contains fibers from C5, C6 and C7 spinal segments. It pierces clavipectoral fascia to supply pectoralis major. Medial Pectoral Nerve – Arises from the medial cord of the brachial plexus, containing fibers from C8 and T1 spinal segments. It passes between the axillary artery and vein to supply pectoralis minor and pectoralis major. Medial Cutaneous Nerve of the Forearm – containing contribution from C8 & T1, it arises from the medial cord of the brachial plexus. In the middle of the arm it pierces deep fascia with the basilic vein, which it accompanies to the anterior surface of the elbow, dividing into anterior and posterior (ulnar) branches. The anterior branch supplies the medial part of the front of the forearm as far as the wrist. The posterior branch supplies the skin of the proximal three quarters of the posterior aspect of the forearm. Medial Cutaneous Nerve of the Arm – arises from the medial cord of brachial plexus. It descends between axillary artery and vein before piercing the deep fascia to supply skin and fat on the medial side of the proximal half of the arm. ← New F.A.P. Upper Limb Seminar date in Toronto now posted…. I could write a book about my experience. I’m so thankful that I was finally diagnosed after a year of feeling that it was all in my head. I also ended up having a first rib resection. All of this could have been avoided had I been listened to from the beginning. If you have a medical issue, be persistent. We know our own bodies better than anyone and when something isn’t right, we need to stand our ground and demand that we are told what is wrong and don’t settle for anything less. It will certainly save you from more severe problems in the long run. Hi Dottie, I’ve been in a similar situation for 8 years. Was there a diagnostic test to show scar tissue on the plexus area? or was the surgery a result tests coming up clear? Hi Shaun. I had what’s called a Somatosensory Evoked Repsonse (it’s like an EMG if you know what that is), but a little more painful. The left side was moving through the plexus at a slower pace, which is why the Doctor felt it was appropriate to “explore” the plexus. I had so much scar tissue the Doc was amazed that I wasn’t paralyzed. I hope you get to the root of your problem. The formal diagnosis is Thoracic Outlet Syndrome (TOS), and most doctors aren’t even familiar with it. It would highly recommend a Neurosurgeon. I’m wishing you the best, and I hope this helps. Hi Dottie, thanks for replying! I just re-stumbled across this site by accident.. without an e-mail alert i thought you didn’t reply. I will definitely look into seeing a neurosurgeon and the SER test. Its generally agreed that after a lot of repetitive movement i pulled the nerve roots of the brachial plexus. It was badly managed at the time and with continued use the symptoms became permanent. So far all tests have been clear except for a spinal scan showing lots of muscle abnormality but this is only the symptoms. I came across this site, http://painmuse.org/?p=171, that details a new functional MRI scan, which as the patient is standing shows Plexus injury that a lying down scan would not, so i think this is also a good option. Many Thanks, Shaun. I had an SSER, which is al Somato Sensory Evoked Response test. Not sure if I spelled it right. The test was suspicious and the surgery is what actually showed why–scar tissue trapping the nerve bundle. It was pretty narly, but made a drastic improvement having as much scar tissue removed as was possible. I still ended up having a first rib resection, but I’m doing really well today and know how to manage any residual pain. I see a Pain Psychologist when I need to. Let me know if you need more info. Sorry for the delay I. Getting back to you. Hope this helps. I am looking into the persistent pain in my left arm and shoulder, and thought I would try therapy. The x-rays I had didn’t appear to show anything wrong, but it seems to be getting worse. I can’t hold a telephone in my left hand for any length of time without numbness and extreme pain in the arm and shoulder. Now, I can’t lift my left arm up as though I’m reaching for something without a lot of pain and restriction. I have had a swelling on the shoulder itself for years, and was told it was a Lipoma, and wouldn’t have to do anything about it unless it affected the nerves of the arm. I already had cervical spine surgery in 1990, and was fused from C4 through C7. I also have noticed that the muscle of my left arm is gone. My left hand/wrist was injured when I tried to catch a heaavy object. Since that time Iv’e had continued and increased weakness in my fingers,ha nd wrist and lower arm. An emg test showed the problem was emitting from the Brachial Plexus. What treatment is available to recover the strenght and teturn the use of the fingewrs in my hand? once the brachial plexus are injured weakness prevails on the muscles supplied by the nerve roots. please specify the movements which you have weakness with. but my advice is to consult a physiotherapist to enhance the strength of the left hand.